If it is possible to be under 'pressure' in somewhere as laid back as the British Virgin Islands, then it is American Ed Baird who is currently feeling it. 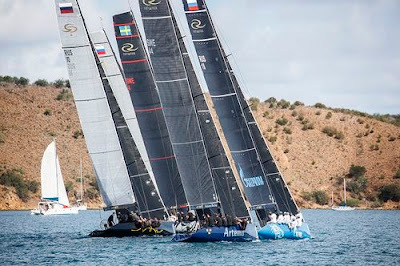 The former America's Cup winning helmsman has stepped into the shoes of Dean Barker, his nemesis from the 2007 America's Cup final, as tactician on Vladimir Prosikhin's Team Nika. 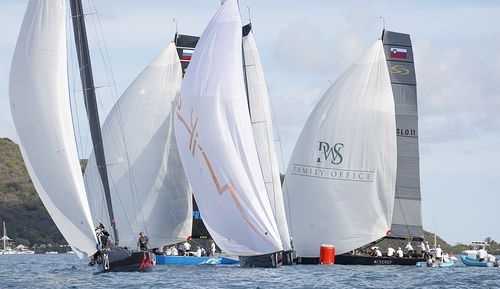 The Russian RC44 currently holds the coveted 'golden wheels', showing her leadership of the class' Fleet Racing Championship, but going into this week's RC44 Virgin Gorda Cup, the circuit's final event of 2015, her overall victory is far from secure. 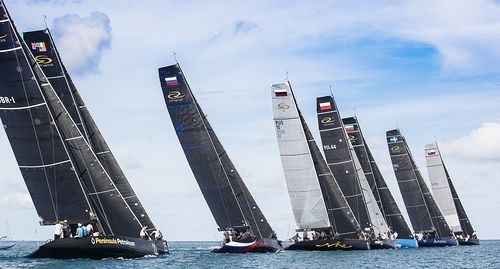 Vladimir Liubomirov's Bronenosec Sailing Team remains just one point behind Team Nika and the two teams have either won or come second in the last two RC44 events. 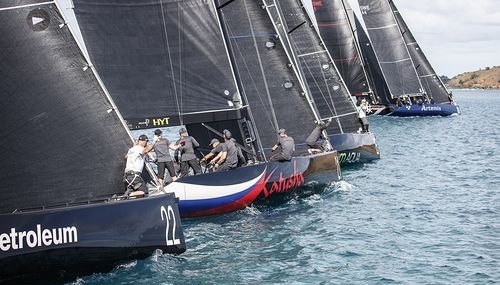 "Everybody has got their eye on the end of the year prize and we realise that there are a lot of boats that can do it, so we have to come together quickly," Baird said. 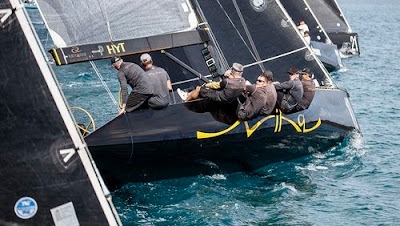 Fortunately, Baird is no newcomer to either the RC44s or racing off Virgin Gorda. In fact he finished third here last year with Synergy Russian Sailing Team. "So many things can happen on this race course: Everyone can expect to be ahead at some point, but everyone should expect to be behind at some point too. It is down to who averages out a little higher," he said. Slovenian Igor Lah's Team CEEREF is the team having the remotest chance of winning the Fleet Racing Championship, currently fifth overall, six points behind Team Nika. 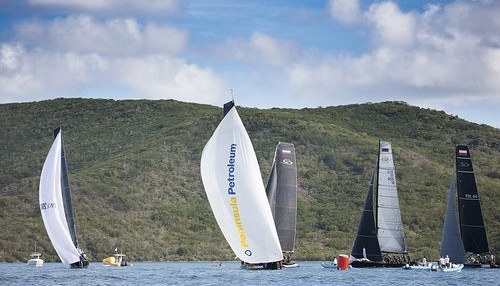 "This is my first time in the BVI - it's brilliant, especially when the sun sets," says Lah of this, the most exotic of the RC44 Championship Tour venues. "We are prepared for everything, so I hope it will be fine. The boat is ready, we are ready, the weather is ready." 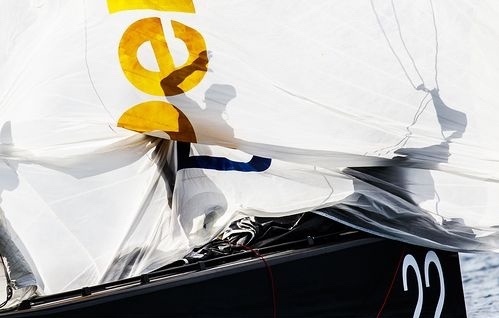 Lah was RC44 World Champion in 2013 and this season is slightly behind the frontrunners, because Team CEEREF was unable to compete in Marstrand this summer. However the greatest threat here, lying just four points off the lead in third place, is Chris Bake's Team Aqua, which is not only a five time winner of the RC44 Fleet Racing Championship, but is also the defending champion of the RC44 Virgin Gorda Cup. "You couldn't find a better place," admits Team Aqua tactician Cameron Appleton of Virgin Gorda. "It's a phenomenal place particularly when the sun's out. Sailing inside the North Sound has its challenges - the better teams and the better tacticians prevail at managing the race course's unique features." These include how to make the most of the favoured left side of the course, where the wind usually accelerates. There are also underwater hazards such as reefs, but these are clearly distinguishable in the crystal blue water. As to their prospects of achieving a sixth title, Appleton confides: "You can't drop this event, so it's a possibility, but you are relying on another team that is on form right now and sailing well to have a bad event. But it's sailing, and teams can fold under the pressure." The forecast for the week is 12-15 knots from the ESE. According to Principal Race Officer, Bill O'Hara, the course will be determined by how full North Sound gets with North America being on holiday from this Thursday with Thanksgiving. "As a place to be, it is pretty special," says O'Hara of the venue. "It will be tight and good with the usual high standard and top tacticians, which always helps." To assist O'Hara, the Yacht Club Costa Smeralda, which is hosting the event out of its winter base in Virgin Gorda, has brought out all of its familiar race officials, led by Edoardo Recchi and Fabrizio Pirina, who usually run the club's events in Porto Cervo, including the Audi RC44 Porto Cervo Cup in June.